This page contains the information on the Nzsale Online Shopping Voucher prize in Macca’s Monopoly New Zealand 2016! It’s available in $1000, $500, $50 and $10 values. Each NzSale Online Shopping Voucher prize comprises of one (1) voucher code entitling the winner to redeem any one (1) or more product(s) advertised on the NzSale New Zealand website at www.nzsale.co.nz, as selected by the winner in their discretion, to the total maximum value of the prize. The Promotional Partner for the NzSale Online Shopping Voucher prize is My Sale Group (ABN 51 601 047 518). NzSale Online Shopping Voucher prizes are subject to the voucher’s prevailing terms and conditions of use (available at www.nzsale.co.nz) and are not replaceable or refundable if lost, stolen or damaged. In order to redeem the NzSale Online Shopping Voucher prize code, winners must open an NzSale user account and register the NzSale Voucher prize’s voucher code in the manner required on www.nzsale.co.nz. NzSale Online Shopping Voucher prize codes are valid until 30/06/2017. NzSale Online Shopping Voucher prize codes are partially redeemable. Any value of the NzSale Online Shopping Voucher prize that is not redeemed by this date will be forfeited. 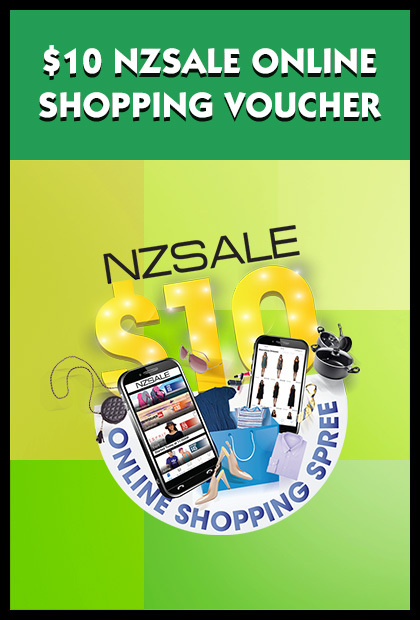 If a winner uses the NzSale Online Shopping Voucher prize in excess of its value, the winner will be responsible to pay for the balance exceeding the value of the NzSale Online Shopping Voucher prize. No compensation will be payable if a winner is unable to redeem their NzSale Online Shopping Voucher prize (in whole or part) as stated for whatever reason.